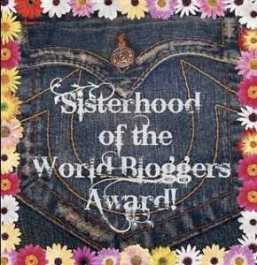 Well, I was nominated by a dear blogger friend of mine called Sister Paulette for the Sisterhood of the World Bloggers Award. I am quite speechless with all these nominations. I first want to give the Lord praise for the award and thank her for this nomination. I am really honored that she would consider me for this award. I have visited her blog several times and can tell you that She is a genuine worshiper after Gods heart. She has a worship blog every wedenesday that has many songs of praise to God submitted by her and others who want to join in and fellowship. I enjoy her wednesday treats of praise and can tell you that she is woman that worships in Spirit and in Truth. God is her main focus in her blog and her perspective about Christ is truly amazing. I totally recommend visiting her blog. As I said in the last award, I have stopped nominating blogger for these awards since I believe there are so many that are deserving of recognition and have decided to instead accept them as they come and give each one to the Glory of God and to thank the blogger that nominated me. Ok here goes with the seven things about myself! 1. I love Pasta especially alfredo and I did a food test a while back that told me I was inclined to eat italian food based on the types of foods I like to eat…and when I started to analyse what it was I like eating, sure enough, I like italian based foods but it’s not the only type of food I eat, I’m just inclined to eat italian food more lol. 2. The last movie I watched was The Magnificent Spider-man…and let me tell you it was really good. I love how Good always triumphs over evil. 3. I love playing intelligent computer games…mostly puzzles and the like…nothing crazy or violent. 4. My favourite color is brown…although technically it’s a natural color not considered a “real color” by art standards but it’s a nice color to me. Some people have told me that brown isn’t a real color and to choose another…but I like brown so I’m stickin’ to it lol 😀 . 5. I’d love to skydive one of these days…it just feels like it would be an awesome adventure. 6. I’m still a lover of cartoons. Cartoons don’t get old with me lol. 7. I love reading books but I also like writing. Editing is my sister’s strongest point…I just love to write creatively but do need editing here and there lol. Well those are the 7 things about me. Hope you liked them. Have a blessed day everybody! Brown was my favorite color in high school. Then I went to college and red became my favorite and eventually switched to purple. Wonderful award–I am so very pleased for you! So thrilled always to learn more about you, dear Sister!